Best Seller Original artwork by artist Amie Kieffer. "This is the type of card that you put on the refrigerator and leave on for weeks because it is so pretty." said a recent customer. Box sets of 12 cards in a gift box. Blank inside any occasion note cards come with corresponding Marian blue envelopes. 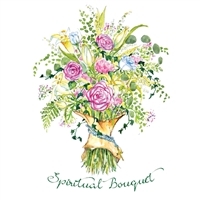 Set of 12 Spiritual Bouquet Cards by artist Amie Kieffer. The flowers were chosen based on their meanings; which are listed on the back of the card. Ivy friendship. White Lily Devotion to Mary. White Roses purity. Purple Roses Desire to understand. Camellia gratitude, spiritual growth. Pink heart felt emotion. Eucalyptus protection. Lily of the Valley sensitivity. Fern sincerity. Wax flowers patience. We chose to leave the inside blank so you can personalize the prayers and devotions of your choice. Card size is 4.25 x 5.5 inches. Accompanied by Marian blue envelopes. Set of 20 cards with white envelopes. "Holding the Rosary is like holding the hands of the Blessed Mother." This beautiful image of Mary reflected within a Rosary bead brings this quote attributed to Padre Pio to life. Original artwork by artist Amie Kieffer. Blank inside any occasion note cards come with corresponding white envelopes. Marian Collection by AK Artistic Production. Each box set includes 6 each of "Immaculate Heart" "Our Lady's Beads" and "Morning Star." Packaged in a set of 18 cards inside a gift box. Each set comes with corresponding envelopes. Set of 18 blank inside note cards with bright magenta envelopes. Original water color by Amie Kieffer.